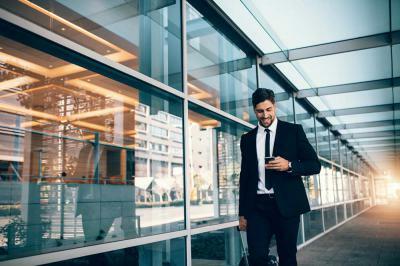 If you travel regularly for business, you’ve likely been frustrated by the amount of time out of the office which you could be using to work on those important projects that have been on your mind for months. However, you don’t have to see travel time as a waste of time – just learn to use it a little differently! Follow our top tips below to transform your downtime into an opportunity for productivity. You can use time away from the office to work on projects that you may have found difficult to approach in the past. Instead of getting frustrated that you are not able to access files or other resources that you would have in the office, think about using this to your advantage and start planning out new projects based solely on your knowledge and intuition –you might be surprised at the creative ideas that flow! While it might be trickier to get in touch with clients once you’re in the air, the time spent waiting in an airport terminal can be a great opportunity to check in with them. Connect to Wi-Fi and shoot out a few emails, or book yourself into the airline lounge and make a few phone calls to key contacts in a quieter environment. Travel time gives you the opportunity to break out of your day-to-day routine and can help refresh your mind and reset your pattern of thought. Often the drudgery of the daily commute and monotonous repetition of office life can leave you feeling burnt out, so enjoy the opportunity that travel gives you to get away from it all and gain a fresh perspective on any issues that may have been troubling you, or simply to relax and forget about the stress you might be under. Personal or professional development projects can often take a back seat when competing with the urgency of your demanding job role, but travel time can be a great opportunity to take stock of your career goals and take steps towards them, whether that’s reading a few chapters of that business management book you’d been meant to pick up for months, or taking an online course to help improve your leadership skills, use the personal time you gain whilst you travel. When it comes to travel, you want efficiency and ease to allow you to focus on the things that really matter, and you can rely on our Florida car service to deliver just that. Our professional chauffeurs will get you wherever you need to be in luxurious comfort without the hassle of parking, traffic, or unreliable public transport. That way, you can relax and make the most of your travel time rather than worrying it’s being wasted!